A 27-year-old male patient presented to the Department of Oral Medicine and Radiology with a chief complaint of decayed tooth and occasional pain in his lower right back tooth region since 2-3 months. The patient's medical history was non-contributory. On examination, root stump of 48 was present clinically. Intraoral periapical radiograph (IOPA) with respect to 48 was advised, wherein we accidentally found morphologically altered 46 with its enlarged pulp chamber extending beyond the cervical area and the absence of normal bifurcation suggesting hypertaurodontism (due to the prismatic or cylindrical form where the pulp chamber nearly reaches the apex and then breaks up into two or four channels). Intraoral periapical radiograph on the contralateral side was advised as it was suspected to be present bilaterally, and it revealed similar appearance on the opposite side as well [Figure 1] and [Figure 2]. Following this, we did a full-volume cone beam computed tomography (CBCT) scan for the patient to evaluate the entire dentition for the presence of teeth with altered morphology. 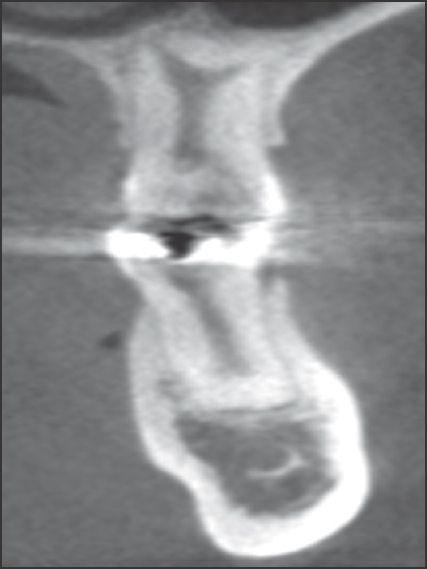 The CBCT scan revealed the presence of hypertaurodontism in the permanent first molars of all the four quadrants. The bifurcation of pulp chamber was 3.5-3.8 mm short of apex, which was evident on the coronal section with all the molars. It lacked the normal cervical constriction, giving the appearance of bull's teeth. Microdontia was associated with 18, while 28 was clinically missing (patient denied any history of extraction). The teeth with taurodontism appeared clinically normal. No other remarkable dental findings were observed clinically or radiographically. General physical examination did not reveal any significant findings. The patient was referred to the Department of Oral Surgery for extraction of 48 [Figure 3] [Figure 4] [Figure 5]. Hypotaurodont: Moderate enlargement of the pulp chamber at the expense of the roots. Mesotaurodont: Pulp is quite large and the roots short, but still separate. 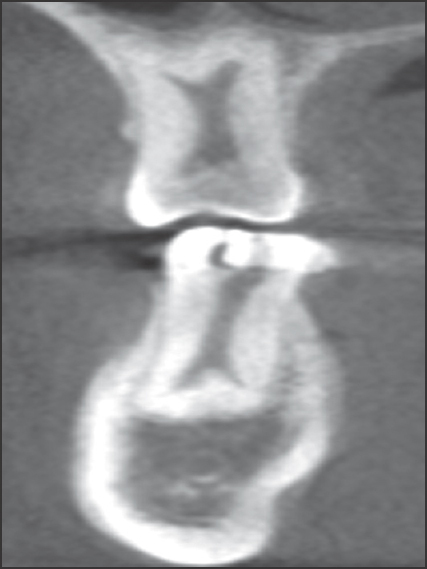 Hypertaurodont: Prismatic or cylindrical forms where the pulp chamber nearly reaches the apex and then breaks up into two or four channels [Figure 6]. Mohr syndrome (oral-facial-digital II syndrome). 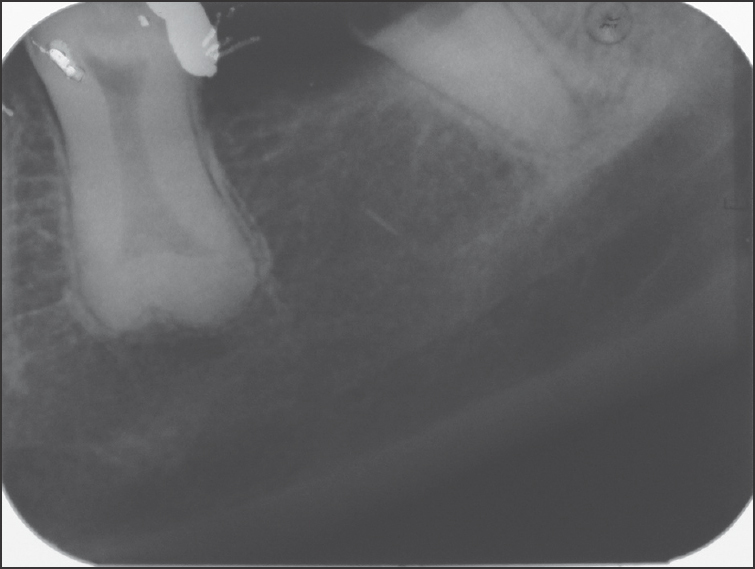 Amelogenesis imperfecta (hypoplastic-hypomaturation with taurodontism). 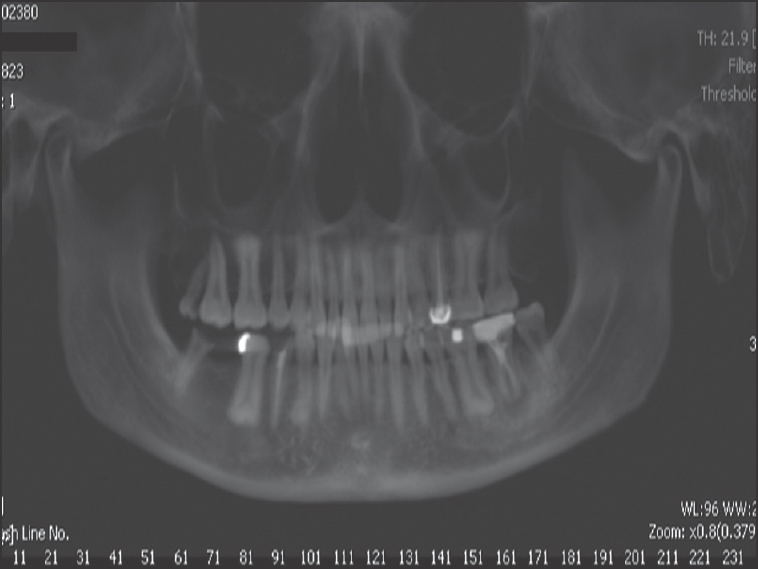 The case presented here shows accidental diagnosis of teeth with taurodontism, depicting that clinically, the crowns of these teeth have normal characteristics and, therefore, taurodontism may be diagnosed only radiologically. These teeth usually do not produce any symptoms, but may have an implication when they need to be treated endodontically or have to be extracted because of the impact of the morphology on the location of orifices, instrumentation, and obturation. Keith A. Problems relating to the teeth of the earlier forms of prehistoric man. Proc R Soc Med 1913;6:103-24. Witkop CJ Jr. Manifestations of genetic diseases in the human pulp. Oral Surg Oral Med Oral Pathol 1971;32:278-316. Manjunatha BS, Kumar KS. Taurodontism - A review on its etiology, prevalence and clinical considerations. J Clin Exp Dent 2010;2:e187-90. Tsesis I, Shifman A, Kaufman AY. 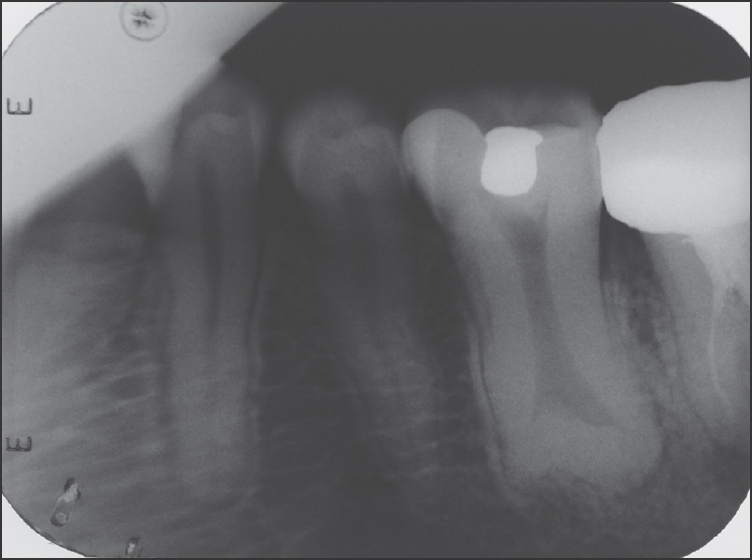 Taurodontism: An endodontic challenge. Report of a Case. J Endod 2003;29:353-5. Shaw JC. Taurodont teeth in South African races. J Anat 1928;62:476-98. Jafarzadeh H, Azarpazhooh A, Mayhall JT. 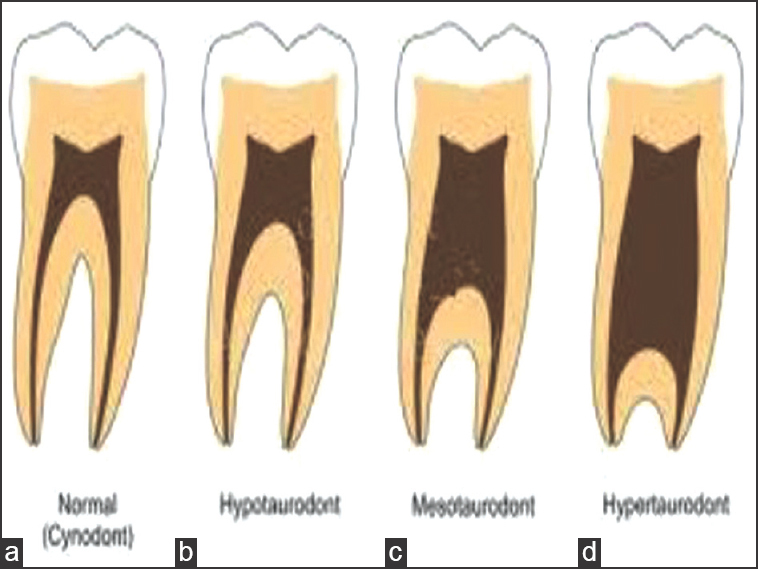 Taurodontism: A review of the condition and endodontic treatment challenges. Int Endod J 2008;41:375-88. Neville BW, Damm DD, Allen CM, Bouquot J. Oral and Maxillofacial Pathology. 3 rd ed. New Delhi, India: Saunders; 2008. p. 94-6. Mark TJ, Carl J, Witkop CJ Jr. Taurodontism, an isolated trait associated with syndromes and X-chromosomal aneuploidy. Am J Hum Genet 1980;32:396-413. Gomes RR, Habckost CD, Junqueira LG, Leite AF, Figueiredo PT, Paula LM, et al. Taurodontism in Brazilian patients with tooth agenesis and first and second-degree relatives: A case-control study. Arch Oral Biol 2012;57:1062-9.